8 Things I’ve Learned from Barbara Walters | Where's My Eraser? Chances are, you’ll have to be better at what you do than men are just to get the same recognition. The people who make us laugh, the people who make us think, the people who make decisions for us—most of the ones you see in the media resemble the dead guys on our bank notes. Despite so many advancements, women still do not have the equality they deserve. But there’s one woman who has been bucking that trend for over 50 years, and that woman, of course, is Barbara Walters. I hesitate to even begin praising her for her sheer grit and determination to become successful because it all sounds so cliche now, but those cliches exist for a reason. They’re all true. After decades of working harder than most of the people around her and enduring the humiliation and degradation of sexism in the workplace and society as a whole, she gave herself the chance to do and be exactly what she wanted. Although the world still isn’t a perfect place for women who strive to be successful in their careers, she has opened so many doors for us. And just as importantly, she’s helped men understand that women can be invaluable colleagues, confidants, and mentors who should have been given a shot all along. 1. Everyone has an opinion worth hearing, and it’s okay to disagree. The day that The View goes off the air will be a sad day for comedians everywhere. Over the years, that show has garnered a reputation for being a 44-minute catfight. But the truth is, Barbara recognized an opportunity to bring people together and let them say whatever they want to. The result has been daily debates about things that matter greatly and things that really don’t. Regardless, that show gets people thinking and talking, and it’s proof that disagreements are much more an asset than they are a liability. 2. Take care of people who are younger than you. Sometimes we need to learn lessons on our own, but having someone to show us the way is invaluable. I’ve heard dozens of journalists over the last couple of weeks, men and women alike, gush with gratitude for Barbara’s mentorship and kindness. She wants to be the kind of person that people can look up to, the kind of person she never really had in her career. 3. Everyone has a great deal to learn from people who have different abilities. Barbara speaks very candidly in her memoir Audition about her older sister Jackie, who lived with undiagnosed cognitive impairments. Admitting that she wished she had appreciated and understood her sister more in their youth, Barbara tells us that Jackie taught her the value of compassion and inclusion for people who are differently abled. Further, she emphasizes that those people deserve to be recognized for their contributions. 4. Don’t be afraid to plug your work. Former co-hosts poked fun at Barbara on a special episode of The View yesterday with a mashup of all the times Barbara had squeezed in a Friday morning plug for an upcoming episode of 20/20. But in seriousness, Star Jones recognized Barbara’s message: “If you care about the work you’ve done, you need to tell people about it so they’ll care about it.” Women, even successful ones, have a difficult time finding a balance between pride and humility. Barbara set the standard for doing just that. 5. Give people the chance to tell you who they really are and how they feel they’ve been misunderstood. There will never be a more famous interviewer than Barbara Walters. People trust her, and she deserves it. She has an unending fascination with people and an ardent desire to let them tell their story. Whether someone is a princess or a serial killer, she affords people the opportunity to cut through the noise and say whatever they think is meaningful. And she knows exactly which questions, often quite simple ones, will elicit that sort of candor. “Tell me about your mother” has been enough to reduce some of the most powerful people in the world to tears. 6. “Now that’s a baby!” Encounter a baby that doesn’t exactly look like a little angel? This is the best response that could ever possibly exist for this type of situation. Vague, but tremendously enthusiastic. If I have a legacy . . . I hope that I played a small role in paving the way for so many of you fabulous women who are here tonight. I can’t tell you how much pleasure it gives me when some smiling young woman comes up to me and tells me of her achievements. That’s my legacy. 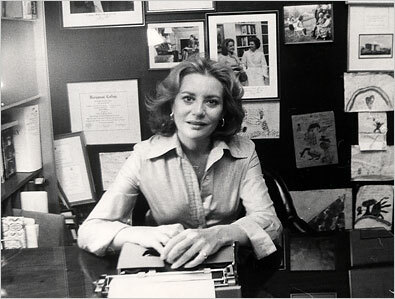 It’s not fair that Barbara Walters had to struggle so mightily to build the career that she wanted, but I’m so grateful that she did. I’ve learned a great many lessons from how she has built her relationships over the years, how she has shaped herself into the kind of person that people want to know and trust. Perhaps that interest in people’s humanity is what set her apart from the old boys’ club. Perhaps that’s a legacy that she never saw coming. This entry was posted in News & Media and tagged #CelebrateBarbara, Barbara Walters, edchat, Education, girlsed, journalism on May 16, 2014 by Chris Thelen.